Wallpaper trends 2018 directed not only on beauty, but on functionality also. Newest technologies allow facilitate cleaning, space modeling, optical illusions creating and environment friendliness. Modern interior design works on surfaces defects correction also, and right chosen wallpapers play important role in it. 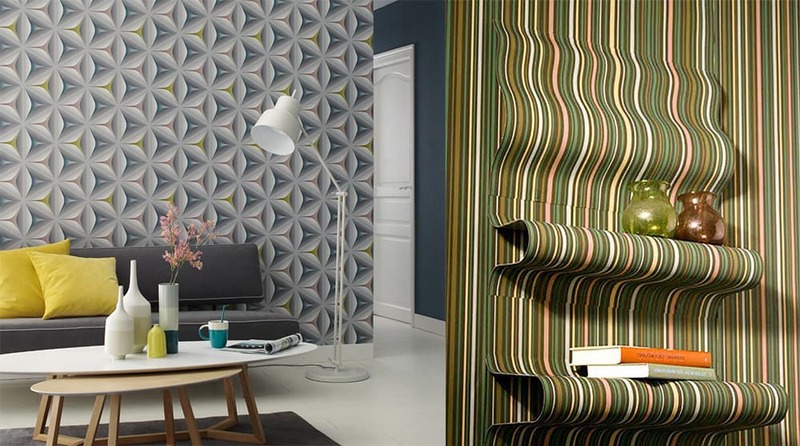 Contemporary wallpapers are really designers’ and inhabitants’ good helpers! So, we’ll talk not only about color schemes here. Contemporary wall design ideas should be really interesting and useful theme to discuss. Read our «Wall design ideas and tendencies: Wallpaper trends 2018» article. 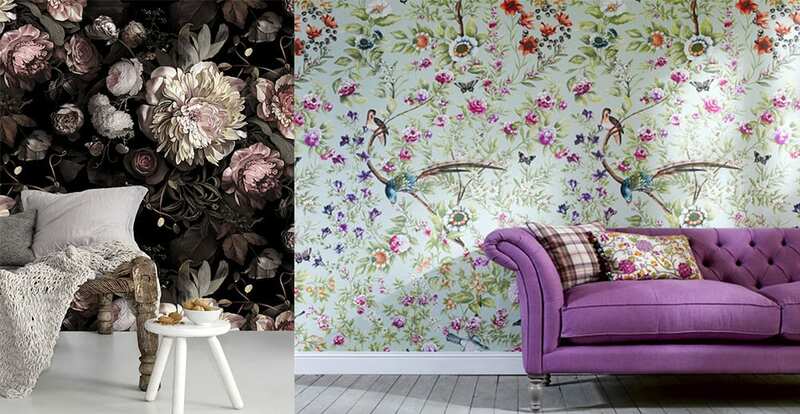 Wallpaper trends 2018 pleasing with their diversity. 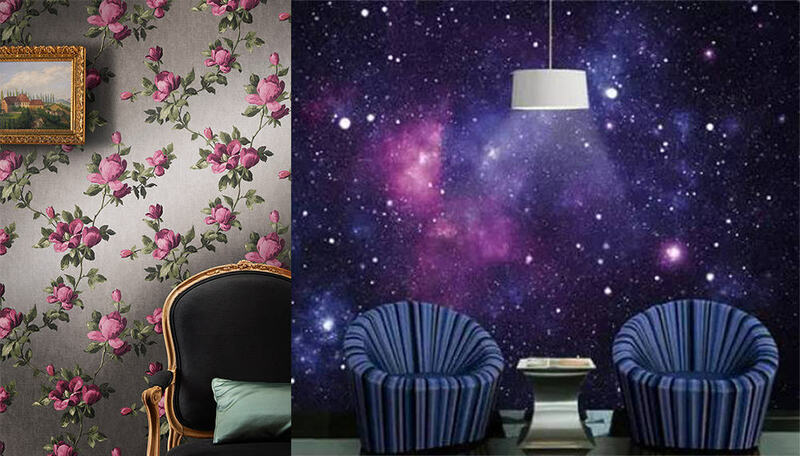 Practicality stays important, but aesthetic side still plays main role in wallpapers choice. And it’s natural, cos wallpapers give mood for modern interior design. Modern digital prints possibilities give new life for simple flat wallpapers. They’ll imitate 3D, differently textured surfaces. So, wallpapers change only should fully transform your space. For example, these are wallpapers, simulating brickwork, cracks, bamboo, wood or even library. Try some «volumetric» ones, with naturally looking light glares. Other option: matt and glossy surfaces alternation creating 3D or embossment effect. Think of such wall design ideas – how they will look with different lighting? Anyway, it should create really modern interior design with it’s beautiful mysteries. Wallpaper trends 2018 sometimes lead to Wonderland! How would your wall look, if magical forest stood right opposite it? Those prints give such impressive feeling! It’s best alternative for painting. Does it seem so simple? It’s not! Textures’ simulating variety, from velvet to metal, give wide range of opportunities to create dream interior! Dip dye effect gains more and more hearts. So it came to interiors also! Dip dye ombre wallpapers allow creating really amazing effects. Remember, gradient walls are already accented and require really esthetic and often laconic furnishing! Patterns won’t leave wallpaper trends 2018, but even get new life! 60th influence brings not only clear geometry, but psychedelic mood also. It’s beautiful echo from past century in modern interior design. 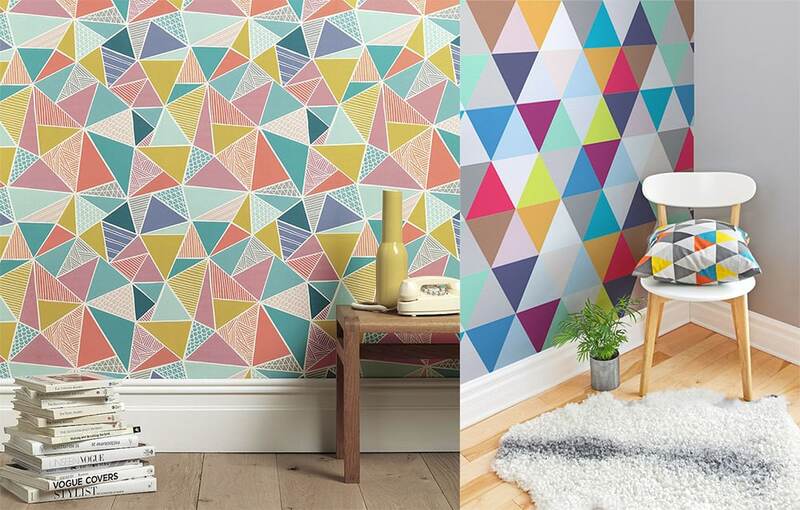 Strictly geometric wallpapers fit Retro, Midcentury and Eclectic styles. 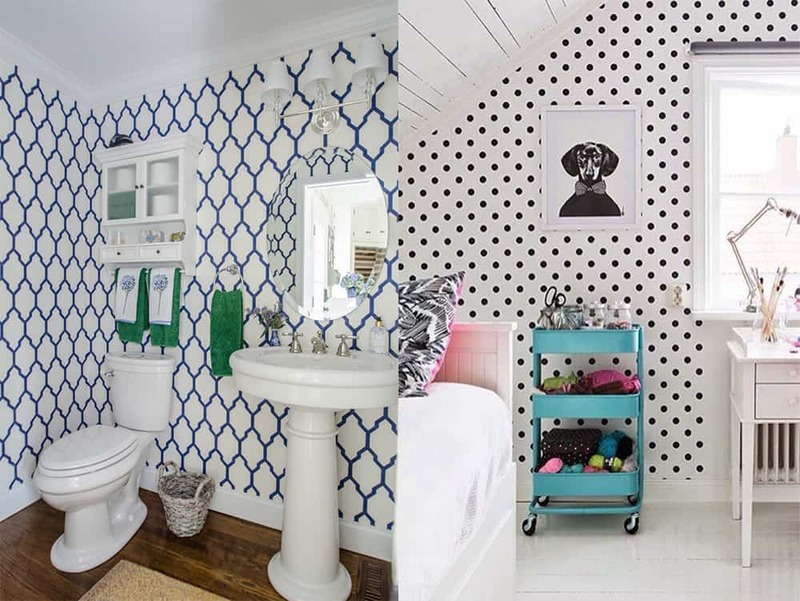 Try some joyful wall design ideas also: uneven polka dot or children drawing style patterns. It’s psychedelic trends we talked about before. 60th like madness now can be integrated even to Scandinavian interior! Often that “mosaics” parts include their own patterns. Such wall design ideas are bright by themselves. So they need more calm colored furniture and decor elements on foreground. Though, there’s an exception with some trendy trick: you can repeat same pattern in small fabric element. Those ones divide on few big groups. Small tender patterns are standard, look wonderful in Provence and Shabby chic interiors. Second trendy kind can be called enriched. Fantasy and animalistic pictures are wedged into floral pattern. And third kind becomes most fashionable: big flowers well-drawn flowers look like they’ll came from classic canvas. It’s wallpaper trends 2018 boom! Industrial motifs, as well as maps, ships and air balloons give special romanticism to any interiors, not only Steampunk ones. Wallpaper trends 2018 take care about your time also. Practicality doesn’t deprive them of beauty. Vinyl wallpapers are very durable and easy to clean. They’re available with wide variety of patterns and textures: from 3D brickwork to flat patterned and realistic photo wallpapers. Non-woven wallpapers – it’s very durable option also. Glue should be added on walls. It makes wallpapers’ gluing easier. Non-woven wallpapers can be painted. 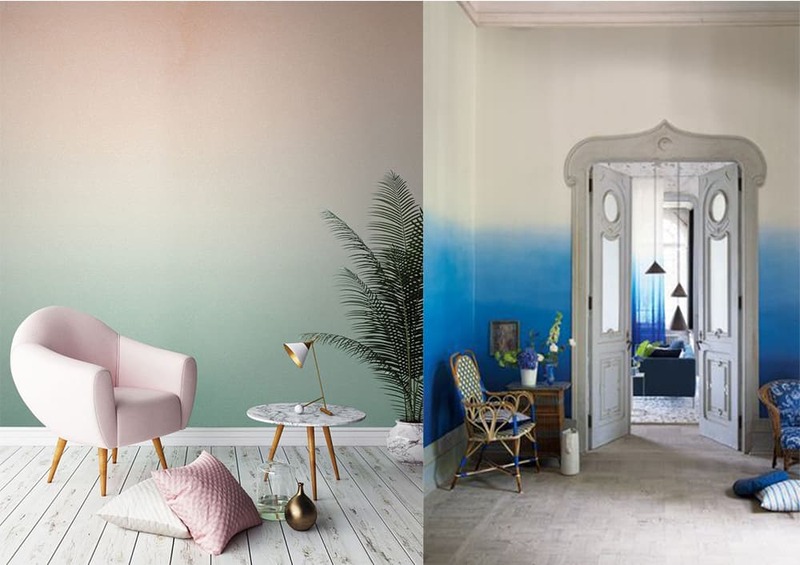 According to wallpaper trends 2018 you’re welcomed to create interesting gradient with them by yourself. 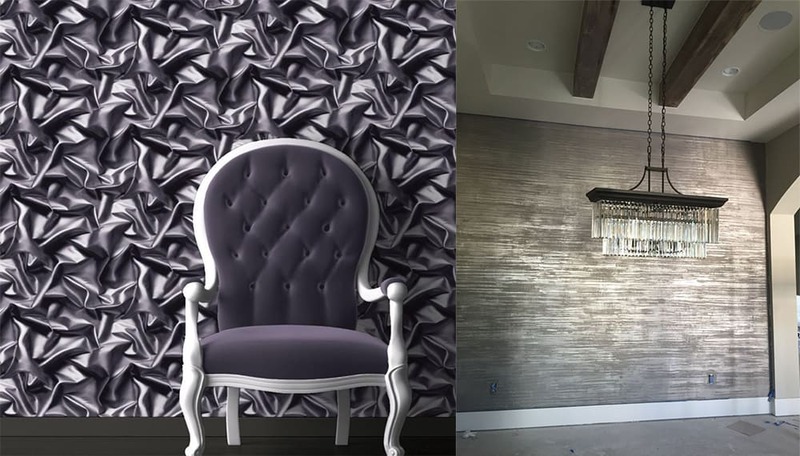 Embossed non-woven wallpapers with silk, metal and crushed velvet textures imitation look most efficient. Textile wallpapers look beautiful, but cleaned harder. Despite this difficulty, they’re often chosen even for kids’ room. It’s not surprising, cos fabric wallpapers are very pleasant to touch. Only place you shouldn’t use them anyway is kitchen. 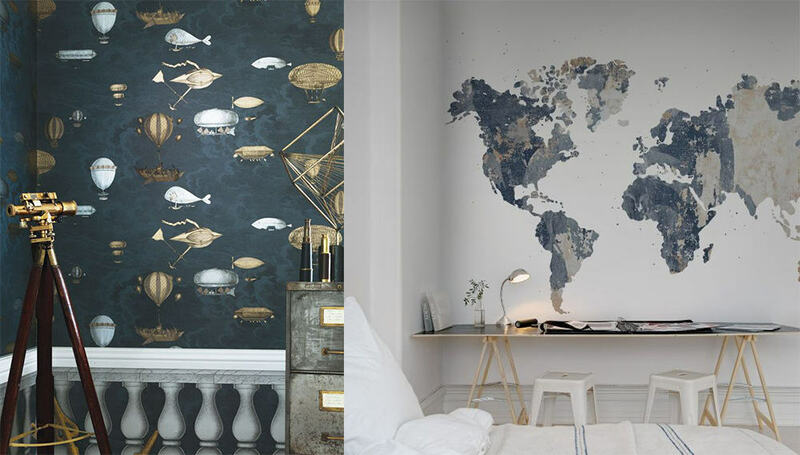 Liquid wallpapers gain popularity in modern interior design. They solve seams problems fully! Their specific texture, as most character feature, attracts their fans and repels “enemies”. And some more tips for wall design ideas. Have defective walls and no time to correct them? Choose dense wallpapers. Non-woven ones mask best. Haven’t too concave surfaces been fully aligned after priming? Highlight them to make look little convex! Find appropriate wallpaper or work with metal spray paint on non-woven ones. Vertical stripes make walls «higher». Even softest glance will increase that effect. Horizontal gradient gives visual «height» also. But it includes additional special effects also. If you’ve used ombre wallpapers with lightest shade on top, area closer to ceiling looks like largest. 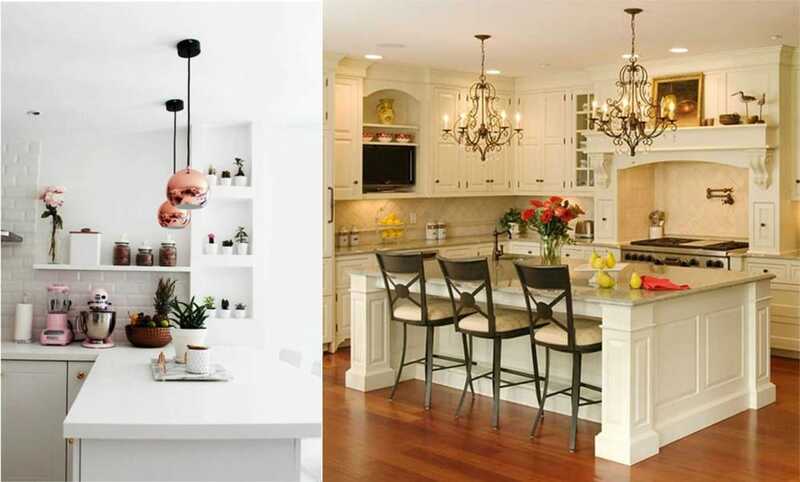 Contrary to prejudice about beige’s practicality, warm tones make space look smaller. 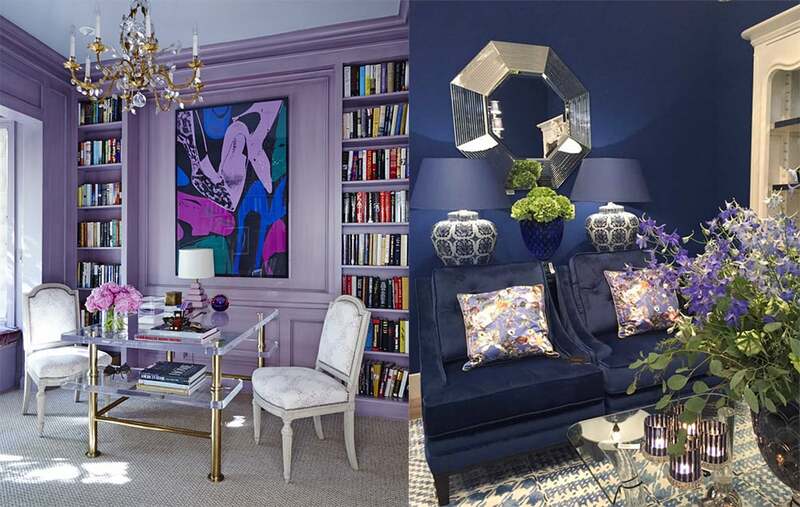 If you’ve already got such color, you need good wall design ideas to get into trend! Zone space near walls with saturated colored curtains. Another good option: make accent wall with vivid patterned wallpaper. Photo wallpaper with beautiful landscape image will look good also. 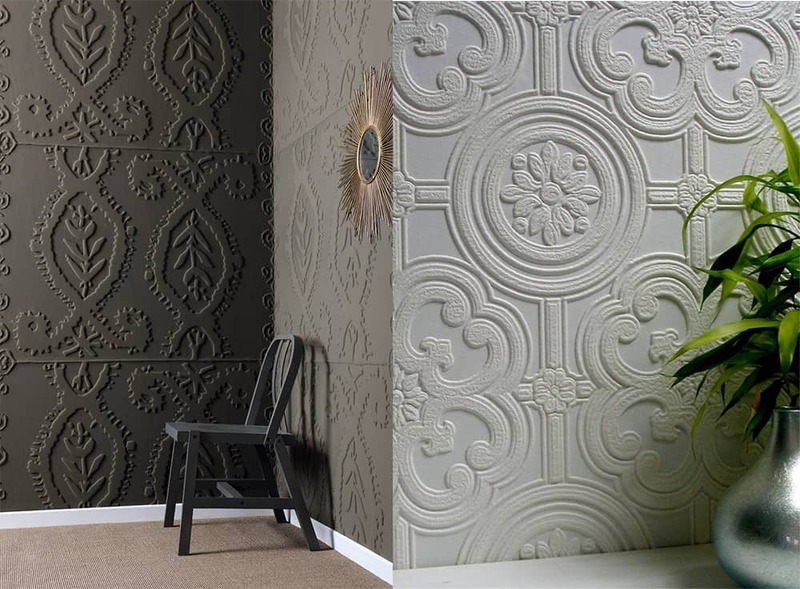 Moldings or embossed wallpapers can “save” classical beige interior. Wall trends 2018 include decorating elements, as florariums. Think of about wallpapers ensemble with them. One-toned fit rich decor best. Avoid too light pastel tones abundance in countries with frequent cloudy weather! Such wallpapers would look attractive at shop, but become greyish with natural light in your home. Artifical light often turn them yellow. Hopefully, our article about wallpaper trends 2018 will inspire you to find best wallpapers for your home!